This week I’m carrying on with the theme of colours in medicine. Today we saw Janet. She is a 55 year old enthusiastic smoker who had been sent up to the emergency department because she was short of breath and had bad pain in the right side of her chest when she coughed or breathed in deeply. “I’m coughing up some really nasty green phlegm” she told us. I love the word phlegm. So much better than the usual word usually used by doctors – sputum, because it is understood by patients and means much the same. So many of the words we use in medicine are Latin or Greek, presumably designed to suggest we know more than we really do. I tried an experiment of banning Latin and Greek words on the ward round when there is an English equivalent. It didn’t last long. Abdomen was replaced by “belly”, sternum became “breastbone”, tumour was “lump”, but many terms like myocardial infarction became too cumbersome and imprecise – “death of heart muscle due to lack of blood supply”. Also, phlegm means something else – there is a wonderful quote by one of my heroes in medicine, William Osler, at the end of this blog about why doctors need it. Anyway, back to Janet. We looked in the sputum pot Janet had been using and indeed there was a big, greenish-gray glob of phlegm. Slightly to the consternation of the young doctor with me, I turned the pot upside down – the glob remained stuck to the bottom . We will only have time for the first one today. The most common answer I get is that the bacteria are green. That is not the case. It is white cells (polymorphonuclear leukocyes, polymorphs or neutrophis) in the phlegm which turn green when they get angry (much like the Incredible Hulk). When they have caught and trapped enough bacteria they get really angry. In fact suicidally angry. They undergo what is known as “respiratory burst”. 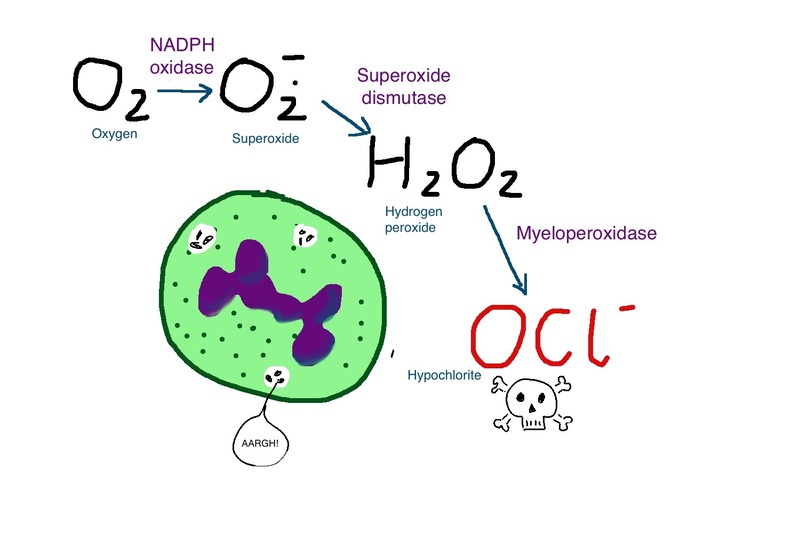 This involves the activation of three enzymes; NADPH oxidase, superoxide dismutase (SOD) and myeloperoxidase (MPO). Ordinary, harmless oxygen is made into the slightly nastier superoxide by NADPH oxidase, and this is then turned into the more nasty hydrogen peroxide by superoxide dismutase. Whereas hydrogen peroxide is not pleasant for bacteria, their tiny evil forms will quake when around them everything turns green. The Incredible Hulk in the form of the lurid green MPO is after them. MPO is an enzyme which is green because it contains haem, a complex but common iron-containing chemical arrangement that is used in a whole range of useful and colourful biological molecules, such as haemoglobin and liver enzymes which inactivate drugs (p450s). The purpose of MPO is to convert hydrogen peroxide into hypochlorite by combining with a chloride anion. Hypochlorite is a really nasty chemical which is intended to deal the final blow. Most homes have a bottle of hypochlorite under the kitchen sink or in the bathroom cupboard – Domestos in the UK or Chlorox in the US. 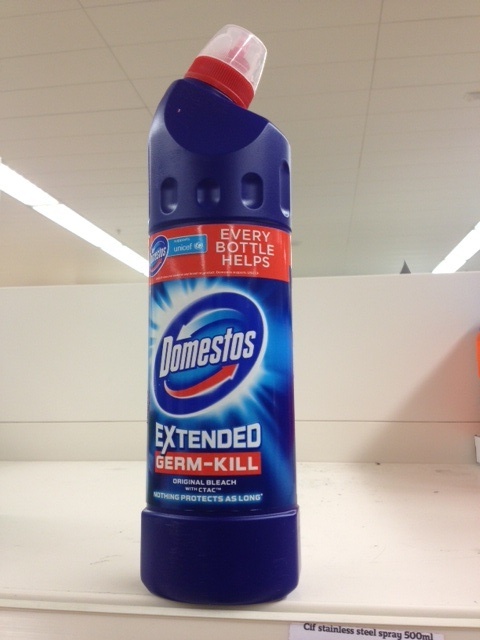 And as the adverts say – it kills 99% of all household germs….Dead! Now give a thought for the poor neutrophil. In all that excitement it produced enough hypochlorite to kill not only 99% of germs but also to kill itself. But just when you thought that it had completely disintegrated with its own toxic, green chemical soup, the neutrophil comes up with a new trick, Terminator fashion. It forms a net around the debris to stop the remaining 1% of germs from getting away. The net is made from dead neutrophil DNA and other stringy compounds, and is thought to be important in both stopping the evil germs that have survived escaping and protecting surrounding host tissue from the damage. Understanding this has given me a renewed respect for neutrophils – determined, courageous and willing to give up their lives to save the world, even using their dead bodies to inflict more damage on the enemy and protect their gene-identical brother and sister cells. You will have to register but it is worth it. In the title I promised horseradish. All horseradishes contain several haem–containing peroxidases, and it seems that when the plant is attacked by insects (or people) this enzyme is activated and will generate bleach-like molecules which contribute to its famous hot and burning taste. So next time you eat wasabe (a particularly potent type of Japanese horseradish), give a thought to how those bacteria feel when being attacked by neutrophils. 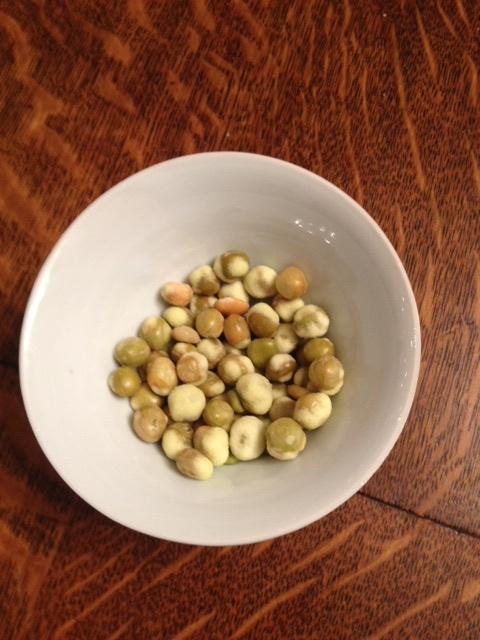 These are wasabe peas. I would suggest you don’t eat more than two or three at once. Is wasabe green because it contains loads of haem containing peroxidase? I’d like to think so but maybe you could let me know.